Senior citizens, who often need long-term care due to aging-related health conditions, comprised 16% of the population of Arkansas in 2012. The Kaiser Family Foundation adds that adults 19 to 64 years of age made up 59% of the total number of citizens. According to America’s Health Rankings, a nationwide health study by the United Health Foundation, Arkansas ranked 4th in reducing the incidence of binge drinking among state residents. Moreover, it has less health disparity in relation to educational attainment compared to many states. Despite these achievements, Arkansas ranked 49th out of 50 among states in terms of overall health factors. One in four adult residents, amounting to a total of more than 500,000 individuals, use tobacco regularly. Arkansas also faces a relatively high incidence of obesity and lack of physical inactivity. Nearly 250,000 adults in the state cope with challenges brought by diabetes. If patients become neglectful in treating this chronic condition’s worsening symptoms, they might experience disability. Based on 2008 to 2010 data from the Center for Personal Assistance Services, over 93,000 older adults in Arkansas who needed custodial care due to disability or frailty lived in residential homes. On the other hand, more than 15,000 stayed in institutional settings. According to estimates, difficulty with everyday activities might affect as many as 142,000 adults in 2025. 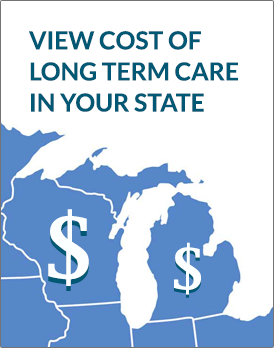 Below are the average daily cost* of long-term care services in Arkansas. MutualCare Solutions, an insurance product by Mutual of Omaha that provides long-term care coverage, entered the LTCI market in Arkansas on September 16, 2013. Among its features are a revised compensation system, modified benefit amounts and benefit periods, and gender-influenced rates. On October 12, 2013, MedAmerica effectuated revisions in the marital and preferred health discounts in its FlexCare LTCI product. Along with revisions, the insurance carrier also removed the option to pay using credit cards. Transamerica started selling its TransCare® III Partnership policies, which comply with the Deficit Reduction Act, in Arkansas and three other states on November 9, 2013. Citizens who own Partnership-eligible TransCare® III policies can request an LTCI policy exchange upon the following anniversary. Prospective long-term care insurance clients can buy policies from American General Life, John Hancock, and LifeSecure. The Medicare government health program provides some care coverage to seniors and individuals with disabilities. Part A covers skilled care services while Part B pays for other services and medical equipment. Part C serves as an alternative to Part A and Part B, while Part D covers prescribed drugs. Around 537,000 state residents benefitted from Medicare assistance in 2011. Senior citizens and people with disabilities can also receive long-term care support from the Medicaid program, provided that they meet conditions for eligibility. Medicaid applications go through the federally-facilitated Marketplace. On January 1, 2014, Arkansas decided to extend Medicaid benefits to more citizens with limited finances. As states adopt a managed care approach for their Medicaid programs, Arkansas allowed enrollees to look for private insurance plans that can also be availed by those who cannot qualify for the program. Senior citizens can access home and community-based care services through a waiver under Medicaid called ElderChoices. Gives comprehensive information about LTC facilities, financing care, and dealing with abuse. Offers lists of various LTC facilities, resources for caregivers, and other useful information.